Twelve hours of flying display with the presence of many national and foreign aircraft and a special guest: USAF ANG F-15C. The 9th edition of the most impressive airshow in Romania - Bucharest International Air Show and General Aviation Exhibition will take place on July 22 at Bucharest Băneasa International Airport. 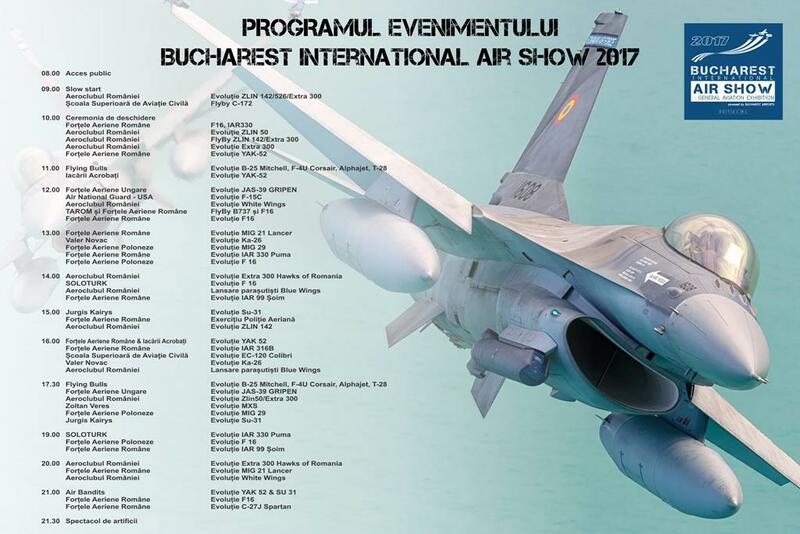 The one day event will include an intense flying program, from 9 am to 9 pm, twelve hours of performaces by Romanian Air Force aircraft (F-16, MiG-21, IAR-99/330, C-27) and some special guests (Hungarian Gripen, F-16 Solo Turk, Polish F-16 and MiG-29 and USAF ANG F-15C). Many civilian acrobatic aircraft will also be present, including Zoltan Veres and the Flying Bulls. The day will be completed by a fireworks show at 9.30 pm.